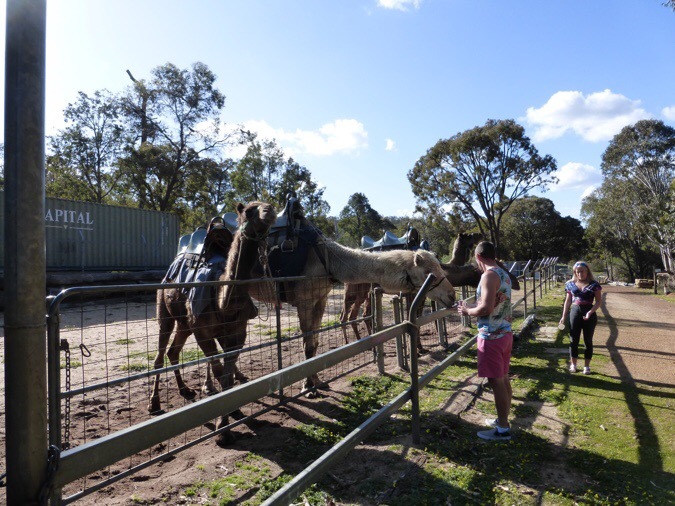 Day 1: First Day, More Kangaroos! 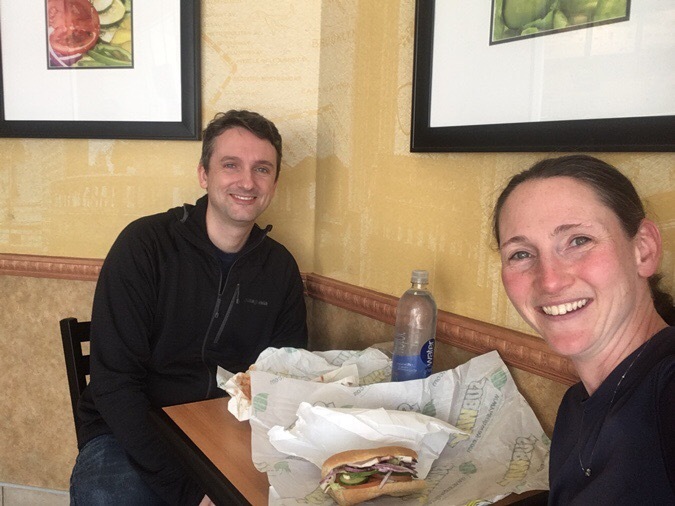 A prehike lunch at Subway. I’ve said it before all good hikes start with Subway. 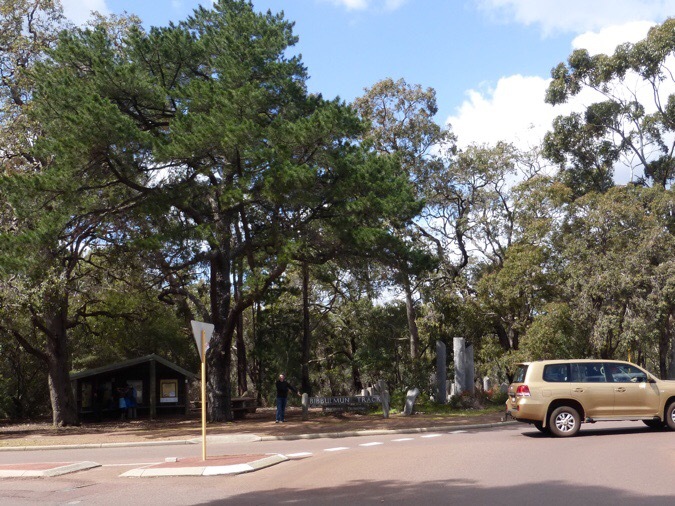 A perspective of the trailhead right next to a busy roundabout. The Bib is a lot like a tamer version of the Appalachian Trail. 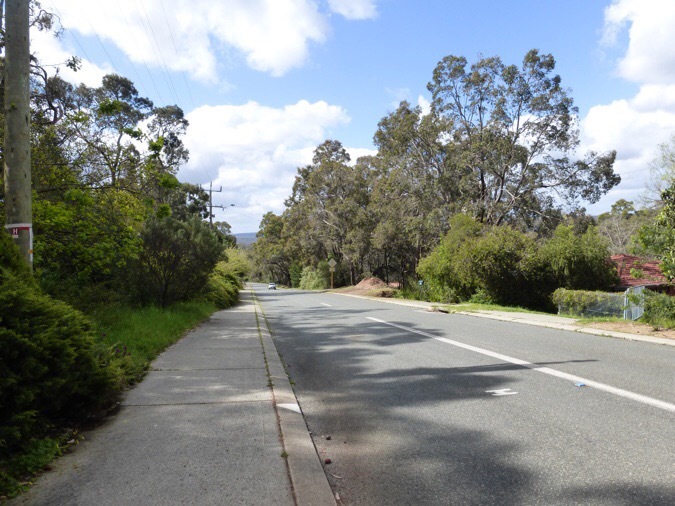 It has many huts and is never too far from civilization often going through towns and crossing roads. Within a couple minutes of starting, the Bib walked along a road for a couple blocks. Marcus drove up, and not surprisingly, I had left something in the car…my rain jacket! That would have been pretty terrible if I didn’t have the rain jacket. Again, I’m such an idiot with leaving things. 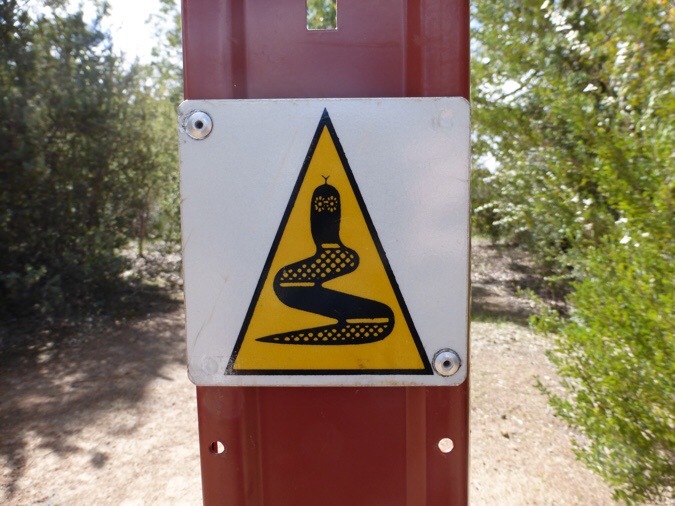 The trail logo is a Wagyl (or Rainbow Serpent), which is an Aboriginal Mythological creature that is said to be responsible for many of the waterways and landforms around Perth. Many of the Aboriginal Dreamtimes (stories) involve creatures that created the unique formations (like Uluru) I’ll be going through. Wagyl or Rainbow Serpent blaze. 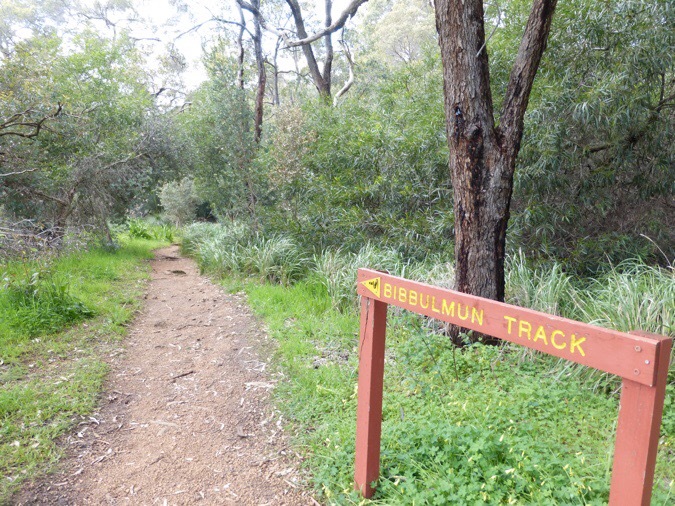 The name, the Bibbulmun, comes from a language group of the Noongar Aboriginal people of Southwest Australia and recognize their practice of walking long distances for ceremonial gatherings. The trees and flowers out here are very unique. The guidebook is quite detailed in describing the scenery, which is nice, but today I just needed to calm my mind and walk. Tomorrow I will make more of an effort to better know what it is that I’m walking through. My mind was swimming with all I’ve taken in over the last couple days while in town between trails, so the guidebook was an overload for me today. I started to read it towards the end of the day once I had mentally calmed a bit. Here’s a sample of what’s in the guidebook. Notice the level of detail and how even specific trees are pointed out. 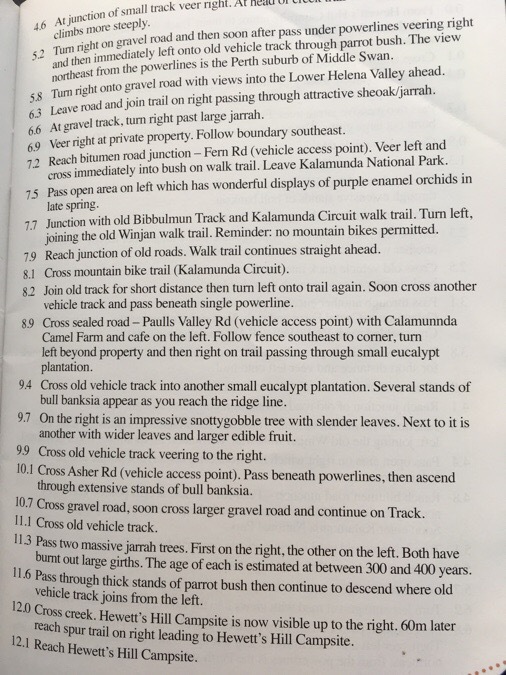 A sample page of the detailed guidebook. 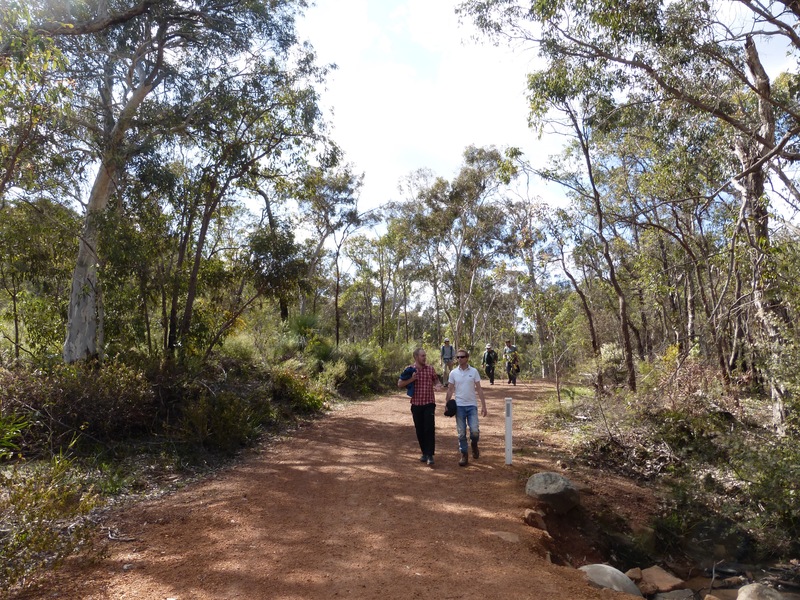 The trail undulated a bit through Kalamunda National Park and alternated between a wide path, a nice smooth trail, a road, and a bumpy rocky trail. Plenty of people and mountain bikers on a holiday weekend here. Passing a camel riding area. I got a couple miles in and reached back for a drink of water, which I had filled at Subway from the drink machine. My bottle felt oddly distended and rigid when I grabbed it. When I took a swig, I immediately realized why. Instead of water, somehow I had topped off my bottle with Sprite. I don’t drink anything carbonated because the fizziness stings my tongue and throat. I immediately spit it out and realized I now had a few hours before I’d get to water. Fortunately, there were plenty of people out and about and the first couple I ran into were able to give me water. Whew, there’s something I’ve never had happen before. 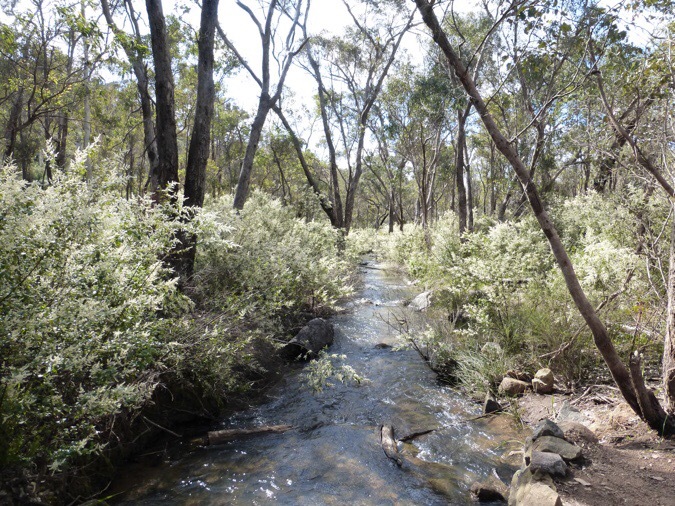 The water out here is seasonal and most hikers just rely on the water tanks that are at the shelters just like on the Larapinta. With the rain lately, I did cross some natural water sources, so that’s good. 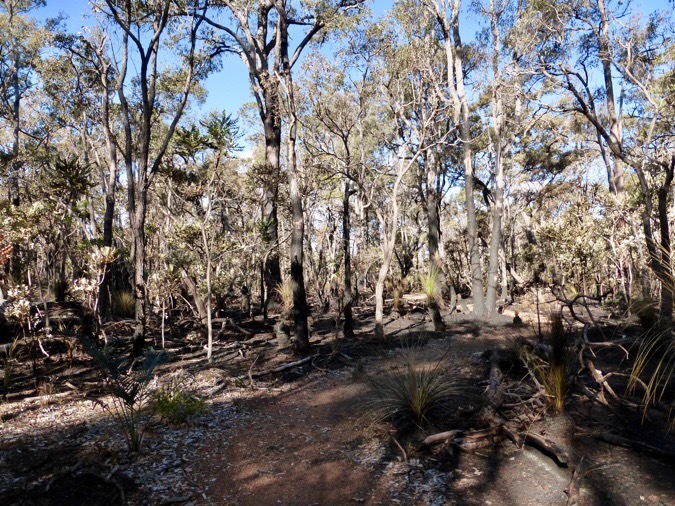 In recent years there have been some bush fires that have burned sections of the trail. Some have reroutes. Here is a section that was burned with a layer of black ash that smelled like a campfire all along the ground except for the trail weaving through it. 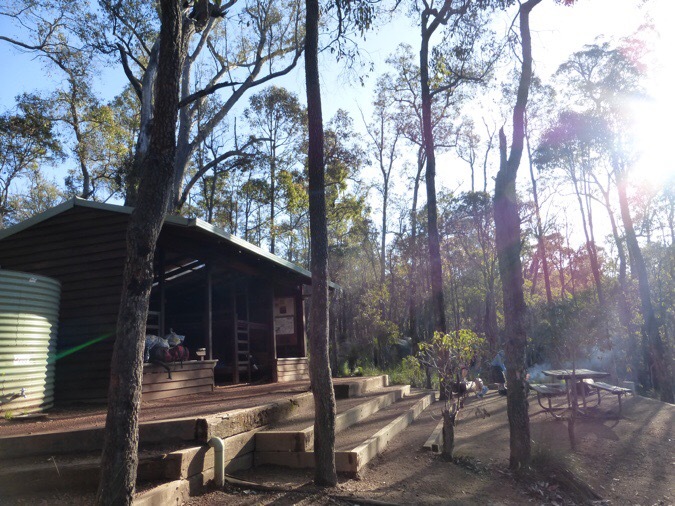 I passed my first shelter, Hewett’s Hill Campsite, and two families were there. They are quite popular and large with campsites there as well. I’d say 90% of the hikers probably camp at them. I’m less of a group camper so I’m going to see how it goes. 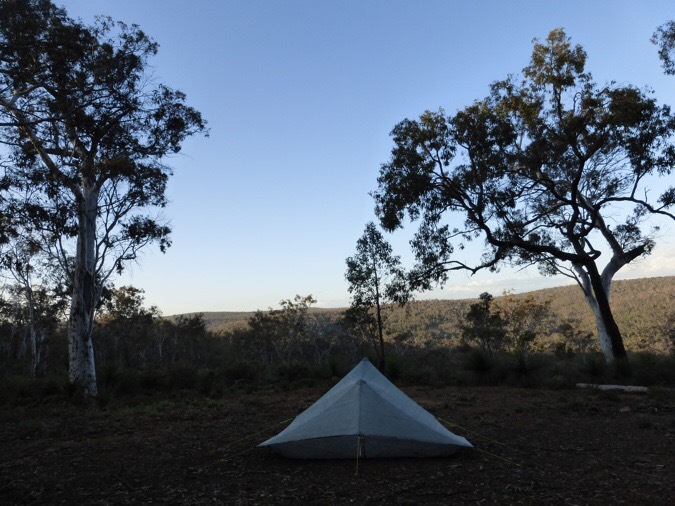 I like landing anywhere at the end of the day and not being restricted to the campsites, but it is nice to sleep with water and a toilet. I grabbed water and decided to do a bit more since it was only about 4:30pm. The forest out here is quite dense with trees well spaced, but lots of brush on the ground. I figured I’d just keep an eye out for a good flat spot and grab one once I saw it. 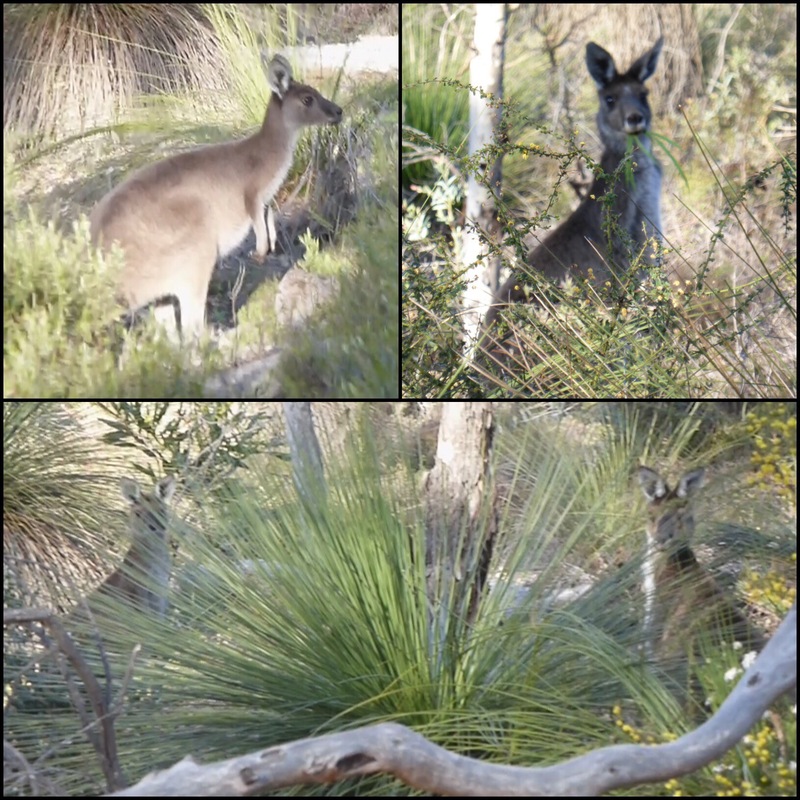 Not long after the shelter, I came up on a mob (yes I looked that up) of kangaroos! There’s video I got but that’s on FB and Insta because I wasn’t able to load it on the blog. Here are photos from the video. I’m sure the novelty will wear off as they should be quite common on the Bib, but it hasn’t yet! I was glad I walked on because I was following a dirt road that had many flat viewpoint areas. After passing the third (and best) spot, I decided to take it before my options ran out. I have a view, of the Helena Valley and can see Mundaring Weir wall. There is a reservoir there that has restricted times to walk through (or you walk a road alt), so I timed my start to end today just before it and be able to walk through in the morning. I got to camp nice and early at 5:15pm and it got dark enough to need my headlamp by 6:45pm. I had grand plans of watching my shows that premiered this week in the US, but my energy has been off with this early darkness. It wasn’t even 8pm when I crashed for the night! I figure I should listen to my body and accepted the early bedtime. It was a great start to the Bib! The fauna and flora down there are really unusual. Good idea, but I think I just need to slow down and take my time more. Oh, and no koalas out here and nothing to fret about needing a canister for. Yes, sadly that rain is hitting…but I have the raincoat! 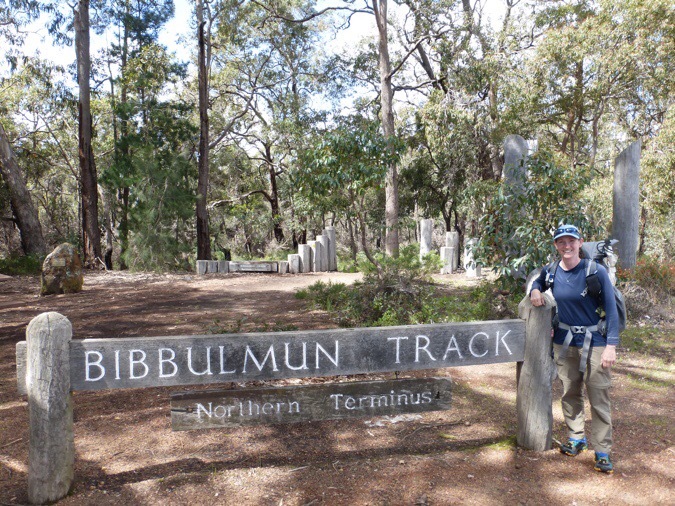 Love your blog – also following you on fb – live in South Africa (all my kids in Australia) will be in Perth from mid October and the Bibbulmun is def on my list. Not end to end tho 😉 maybe someday. Enjoy the walk and keeping them good pics coming. Oh that’s cool. Plenty of options for sections. Some are more entertaining than others. The Mt Cooke day was a good one going over all the mountains. Other days maybe just woods. If you should see The Greene Room fitness center in Albany, tell Mark and Debbie Greene that Mary Nell from Florida sent you with my blessings. I am going to love this trek. Have a great journey Erin and good luck. I would love to be doing what you are doing and am enjoying following along your adventures. Thank you Catherine! I know I’m lucky and don’t ever want to forget that or take this freedom for granted. You forgetfulness is part of why we all love you. You’re human! Do not listen to the above advice about pharmaceutical drugs. Are you kidding me? You are young, strong and healthy and want to stay that way. Do not pollute your body with unnecessary chemicals. Congratulations on your first day on the Bib. I so look forward to this adventure. You are the first thing I read every morning when I wake up. Thank you for taking us along. I have followed you since day one on the PCT…quite a few years now! You really made me laugh today as I belong to a local hiking group here in Joshua Tree and most of the members get Subway before we go on a hike. Too funny! Blisses and blessings to you dear girl!! I did just finish reading Atul Gawande’s The Checklist Manifesto…..maybe a tiny laminated list would help. The detail in that guidebook..wow..
Looks like you got a nice spot to sleep. Great start to the Bib! I just realized that I haven’t seen a video from you in ages. I love the blog but I do miss the old video updates. Safe travels! This week when I left a shelter, I commented to the others I tend to leave things and did a look on the tables to make sure I didn’t leave anything. Then I walked up the trail and reached for my gloves…that I set on the table subconsciously while checking the table, ugh! I too had a laugh when Marcus drove up with your rain jacket. Yes a great start to the Bib. I do hope the bad weather stays clear of you. I just love your ‘roo’ shots. Most Aussie’s still get excited when spotting one or a ‘mob’. I’m not sure whether David G was serious re canisters for the koala bears. They are in fact not bears but an Australian marsupial. Unfortunately they don’t live in Western Australia. 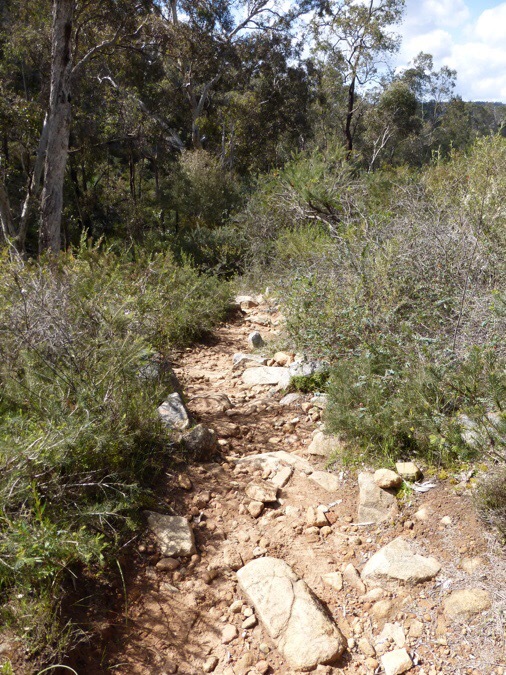 Congrats on yet another start to a new trail. Hope you have fun out there and see a few more mobs before you finish. You gotta chuckle at Marcus pulling up with your rain jacket. That’s a real blessing right there! It’s almost like a lucky omen at this point. I don’t much like milo either. I would rather have cocoa with lots of sugar! However, Woolworths Supermarkets sell their own brand of hot chocolate, 99% fat free, no artificial preservatives, colours or flavours. they come in a box of 10 single serve sachets, and I must confess that I am hooked on them. I’m trying to be “healthy”. It’s grown on me to warm it with dinner with how cold and rainy it’s been. So funny for me to read about a hike that is in my backyard. I’m so used to following you on american trails! I look forward to reading your thoughts about the Bib. Keep safe tonight, a bit wild out there! Still surreal to me to be here! Ha, that’s great! Yes, the comments are half the fun sometimes.